Measuring viscosity is an effective way to know the state (properties of matter) or fluidity of a liquid or gas. It plays an important role in the quality control and in various research and development stages of a wide range of industries, including Food, Chemical, Pharmaceutical, Petrochemical, Cosmetics, Paint, Ink, Coatings, Oil and Automotives. For example, the viscosity of a liquid is an important parameter for designing the piping in a plant or transporting crude oil or chemical agent through a pipeline. In the electronic engineering industry, photresist fluid is used in the production processes of the printed circuit board, cathode-ray tube, and flat liquid crystal display. Controlling the viscosity of photoresist fluid is a crucial factor to determine the qualities, performance, and yields of finished products. Among those industries, it has been also recognized that controlling optimum viscosity reduces production costs. Viscosity, which is also called a viscosity coefficient, is a measure of a fluid’s resistance to flow. It is the substance constant indicating the magnitude of the fluidity of a fluid. In general, viscosity is associated only with liquid. Gas also has viscidity, but it is a relatively inviscid fluid, the resistance to flow can be ignored. ■Newtonian fluid, subject to Newton’s law of viscosity, viscosity is constant regardless of the flow (movement). ■Non-Newtonian fluid, which is not subject to Newton’s law of viscosity, viscosity changes according to the flow (movement). As viscosity units, P (poise) , cP (centi-poise) – CGS unit system – or Pa.s (pascal second), mPa.s (mili pascal second) – SI unit system – are used. For example, the viscosity of distilled water is well known as 1.002 mPa.s at 20.00 centigrade at 1 atm. Temperature is a very important factor for measuring viscosity. In fluids, as temperature goes up, viscosity goes down and vice versa. In the case of distilled water, if the temperature changes 1 centigrade, it produces a difference of 2 % to 3 % in viscosity. The figure 1 shows the basic mechanism of one of the vibro viscometers, A&D’s Sine-wave Vibro Viscometer. When the spring plates are vibrated with a uniform frequency, the amplitude varies in response to the amount of frictional force produced by the viscidity between the sensor plates and the sample. To produce uniform amplitude, the vibro viscometer controls the electrical current that drives the vibration of the spring plates. Because the frictional force of viscidity is directly proportional to the viscosity, the driving electric current for vibrating the spring plates with a constant frequency to produce uniform amplitude is also directly proportional to the viscosity of each sample. 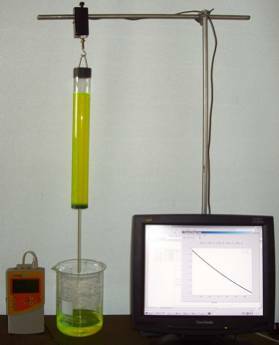 The vibro viscometer measures the driving electric current, and then the viscosity is given by the positive correlation between the driving electric current and the viscosity. A motorized cylindrical rotor is inserted into a sample and rotated at a constant speed. The rotational viscometer employs the measurement method that assumes viscosity is directly proportional to a running torque required to produce a steady rotating motion. As shown in figure 2, when the rotation becomes steady, the running torque caused by the viscosity and the twist of the spring is balanced. The twist angle of the spring is proportional to the viscosity of the sample, and an index of this is displayed on the scale. Some devices display the digital value of the viscosity coefficient converted from running torque. 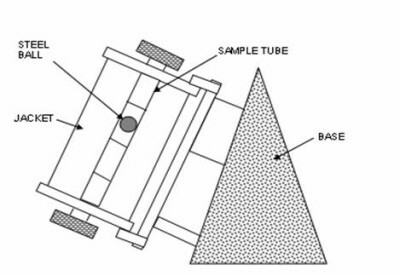 The method shown in figure 2, the single cylindrical rotational viscometer. In principle, the rotational viscometer is a fine measurement method. However, it requires several kinds of rotors to cover a wide range of measurement. The measurement range of a single rotor is narrow and, as a result, the continuity of a measurement is disturbed and lost when exchanging rotors. In addition, the measurement accuracy is guaranteed only for the full scale. Errors in measurement are inevitable in the lower viscosity range. In the worst case, accurate viscosity might not be obtained because viscosity varies due to the gradually rising temperature of a sample after starting the measurement in both lower and higher viscosity ranges. This happens because in lower viscosity ranges a larger rotor is required to detect torque and, in higher viscosity ranges, a higher quantity of kinetic energy is caused by the greater frictional force exerted on the rotor. In a capillary viscometer the laminar flow of liquid flows through a cylindrical capillary tube. You determine viscosity by measuring the flow rate of the fluid flowing through the capillary tube and the pressure differential between both ends of the capillary tube. This measurement method is based on the laws of physics; therefore, this is called the absolute measurement of viscosity. There is an another type of capillary viscometer, made of glass, is shown in figure 3. Although using this capillary tube is not easy, it has a simple principle and structure. Due to the simplicity of the principle, it has been used for a long time and has been greatly improved over the years. 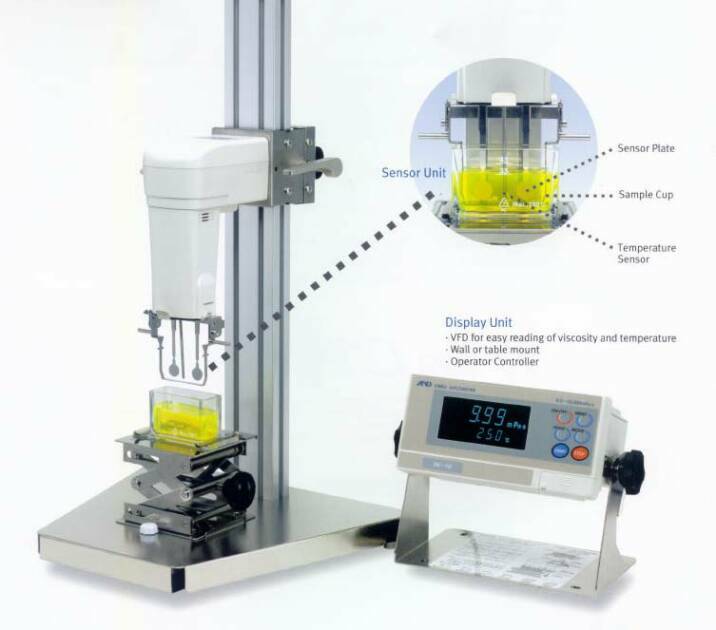 This capillary viscometer can obtain kinetic viscosity by measuring the time it takes for a certain amount of sample to flow by free-fall through the capillary tube. Each viscometer is given the viscosity constant, which was valued by calibrating with a Viscosity Standard Fluid. The principle and structure of the capillary viscometer is simple. However, to take accurate measurements, you must keep the inside of the capillary viscometer very clean. Before each measurement you must clean it using a cleaning liquid such as benzene, followed by another cleansing with acetone, then rinse using purified water. Also, a thorough drying of the capillary tube is required between each cleaning. Temperature control is also essential because glass is susceptible to thermal expansion or contraction under the influence of temperature, especially in lower viscosity ranges. These thermal impacts might introduce errors to the measurement. 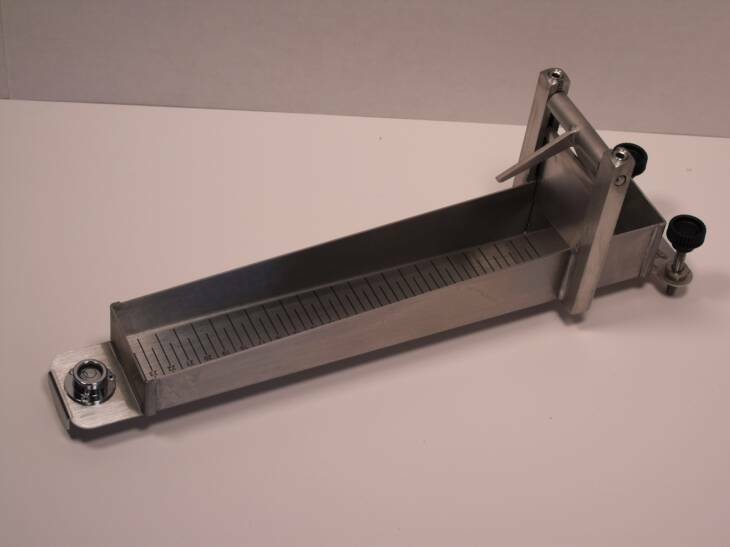 You must also measure the density of the measuring sample beforehand because the viscosity is given by calculating from the measured result acquired as kinetic viscosity. The falling-ball viscometer measures viscosity by dropping (free-fall) a column- or sphere-shaped rigid body with known dimensions and density into a sample and measuring the time taken for it to fall a specific distance. Figure 4 illustrates the principle for the viscosity measurement under the law of free-fall of a rigid body in the gravity field. Another type of device measures traveling time when horizontally transporting a rigid body, such as a piston, in a sample fluid at a constant speed by the force applied by the electromagnetic field. Unlike the vibro or rotational viscometers, the capillary and falling-ball viscometers shown in figures 3 and 4 cannot continuously measure viscosity. It is also impossible to continuously output digital signals of viscosity coefficient or to control data. When measuring the viscosity of paint or ink, the cup type viscometer as shown in figure 5 is sometimes used. The same method is also employed for adjusting the viscosity of coating applied to automobile exteriors using an electrostatic atomization paint sprayer. As shown in the figure, the cup type viscometer measures the time it takes for a sample filled in a cup of a specific capacity to outflow from the orifice of the cup. 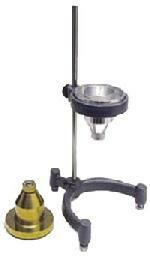 The Ford Cup Viscometer is a typical cup type viscometer. Normally, the time the sample takes to outflow from the orifice is measured using a stopwatch. However, the digital Ford Cup Viscometer detects the outflow of the sample with an optical sensor, automatically calculates the time necessary to finish continuous outflow, and digitally indicates it by 0.01 seconds. Like the capillary and falling-ball viscometers, the cup type viscometer is not suited for a continuous measurement of viscosity because data as an electronic signal is difficult to obtain in the measurement. Use the Bostwick Consistometer on any viscous material such as sauces, salad dressings, paints, chemicals or cosmetics, to measure the distance a material flows in a given time interval. 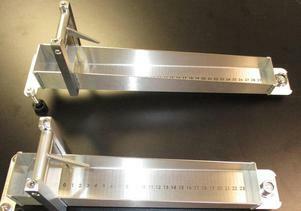 The Bostwick complies to Mill Spec R-81294D and ASTM F1080-93 and is made of stainless steel construction.